Incredibles 2 has quick-witted action and glorious, good old-fashioned, fun, raves Sukanya Verma. The silver screen is reporting so much superhero activity these days, it's almost as if no other kind of movie gets made any more. Summers are especially crammed and enthusiasm wears thin. Just then something like Incredibles 2 comes along and breaks through the monotony with its quick-witted action and glorious, good old-fashioned, fun. More than a decade after their first appearance, the 'Supers' return on a winsome note for Director Brad Bird's cleverly chalked-out sequel. In Disney-Pixar's win-win tradition, technical wizardry weaves its magic into purposeful story telling and draws its youngest viewers and their families into a world that seems as recognisable as their own and yet so delightfully far removed. 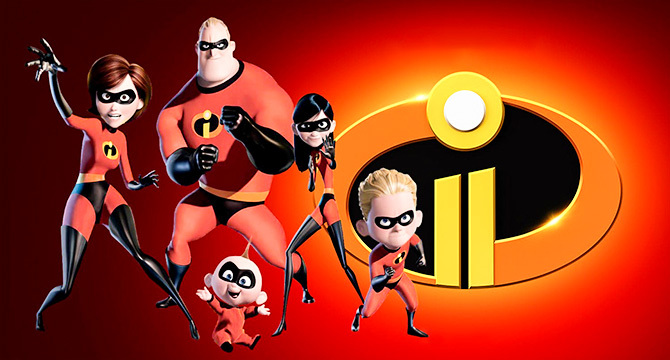 In The Incredibles, a family of superheroes takes down a cuckoo fanboy; the second part resumes exactly where it left off with the Parr family keeping off a brand new threat. The ensuing pandemonium and kapow doesn't bode well with the authorities keen to avoid a Superman-General Zod battle in Metropolis situation in Man of Steel. The Parrs are forced to shut shop until opportunity knocks the door yet again though only for Helen aka Elastigirl (Holly Hunter). Meanwhile, her Bob-er half/Mr Incredible (Craig T Nelson), half-grudgingly, agrees to mind the kids -- Violet (fussy, boy shy and occasionally invisible), Dash (the restless speedster) and Jack-Jack (evoking aww and awe with his cuteness and countless new powers). Even as BFF Frozone (Samuel L Jackson) and superhero costume designer Edna Mode (Brad Bird) pitch in chuckles and charm, there's a trouble flashing in the form of Screenslaver. A shadowy antagonist -- taking control over the minds of his victims by blasting the screen with brightly blinking optic images (visually sensitive, take care) -- lurks loose, as Elastigirl tracks its whereabouts aided by an influential brother-sister duo (he sells, she creates) running a telecommunication empire. For a premise set in the 1960s, the sister in question is curiously contemporary in both her look and lookout. There are moments between her and Elastigirl that evoke the feminism of #MeToo times. Bird offsets its significance by light-heartedly documenting a father's struggle at what is conventionally looked upon as mommy duties. Raising regular kids is hard enough, but when you have three of the enhanced variety of which one is a toddler who can multiply, vanish, bloat, breathe fire and transform into a Hot Stuff reminiscent demon, the challenges are endless. Under Bird's witty vision and a voice cast of expressive actors, a jumble of concerns like domestic woes, parenting hassles, gender equality, growing pangs, superhero power dynamics and a dangerous dependency on packaged ideas of evolution find their own sweet, if somewhat superficial, spot. What ensues is a zippy, rib-tickling tug of war between everyday and out of the blue. For all its weighty metaphors and existential insights, Incredibles 2 is most enjoyable when it submits itself in the hands of a milk-guzzling baby. Jack-Jack is a masterstroke, a diaper-clad toast to fanciful imagination and infantile spirit. It wouldn't come as a surprise if someday, he stars in his own movie. As of now though, Incredibles 2's tottering scene-stealer is more than pleased to be the best thing about its flying, fizzy, whimsical, endearing and 3D action-packed two hours.